It's so therapeutic throwing finished products in my empties basket. Maybelline BB Cream - This worked well for me. It had great coverage and didn't feel heavy. My dry skin was able to comprehend this during warmer the weather. It did great with blemishes but didn't cover my pores too well. Revlon Age Defying Spa Foundation (Medium) - I gained a nice tan lately but medium was still a bit dark. Light weight and light coverage. A VERY obscure scent, smells like heavy duty chemicals. I definitely won't be purchasing. Tea Tree Body Lotions - A part from scent and texture, I can't really tell the difference between what is considered to be "good" or "bad" lotions. I thought they weren't too bad. Lonvitalite Red Wine Collagen Firming and Moisturising Facial Mask - This was great! My face felt nice and plump after application! Although it's hard to tell the difference with one sheet. Compeed Invisible Patch -These are for cold sores. To use, apply the little translucent circular sticker on to your cold sore during the day or over night. I get small cold sores when I eat certain foods, I'd chuck on a patch and it will literally disappear over night. Disregarding the size of your cold sore, it will heal within a few days. I've never tried Cold Sore creams but I don't think I will with these babies. Maybelline EverFresh Makeup - This foundation has been sitting in my box for a long time, finally decided to chuck it out. I am pretty sure Maybelline uses bleach properties in some of their products. The sink had patches of orange after i washed my face, my purple towel also had orange patches where I wiped my face. If this happens, throw your makeup out, do not re-purchase. Estee Lauder Magna-Scopic - I received this little sample from a promotion a while back. It served me well. Easily rinsed in water. I've made a couple of "looks" with this mascara on. Click here to see. 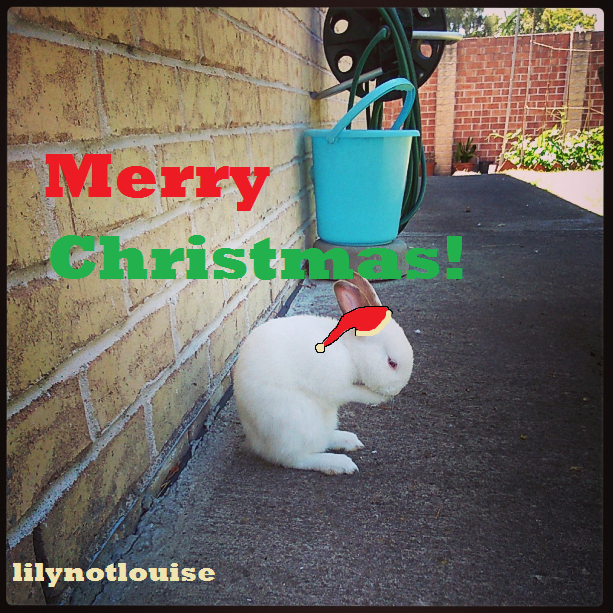 I made this little christmas photo ^_^ I have a bunch of rabbit photos on my instagram! Follow for a follow?? Let me know on my blog. I have a LOT of sachets lying around and been trying to get through them all, it's difficult! I love your wallpaper!!! ^_^ kawaii!!! it sounds scary about that maybelline foundation :S? but its not likely related to bleaching property. once i touched my makeup with loose mineral powder. Some powder fell on the sink and left stains after combined with water. i guess it just indicates whether the product is water based / water soluble? I want to try that wine mask now - it sounds really nice! Lovely post! I can't believe december is already over! Excellent lot of empties! I concur on the Lonvitalite mask - it's a goodie!